Karl says it’s ok to be this obnoxious since it was my first marathon. I think that’s pretty cool, and if you have the wall space, go with it. After my first marathon, my training partner’s dad surprised her with a shadow box – her race number, her medal, her photo, and her finisher’s certificate all in a giant (and expensive) frame that must seriously have been at least 3’x4′ if not larger. Her tiny one bedroom apartment had no room for it, so she hung it behind a door. That’s the one good thing about our place, it’s freaking huge. So I definitely have the wall space for it! I still think it’s a tad obnoxious. I mean, this doesn’t have my bib and medal and a photo, it has 20 photos of me. From one day! I LOVE, LOVE, LOVE it! So what if it’s huge! You put a lot of blood, sweat and probably a tear or two into training and finishing. You deserve to express your happiness about your accomplishment any way you see fit! When we first moved in together, Joe thought it was weird that I had a hallway in my apartment that was covered with framed snapshots, almost all of me. So what? These were my favorite photos of me, pictures that I liked looking at and that made me happy. Hahaha, I have tons of pictures like that too! The pictures put me in the place I was at the time, so why not? I love it!!!! If I had great pics from the marathon I would do it too!! It’s awesome! Hahaha, thanks! It was the only race where my pictures don’t look like death much. Probably because I was doing good until mile 19. I think for a first or truly memorable marathon, that’s fine. It’s actually pretty impressive. The question now is, where are you going to hang it? I’m thinking either in our bedroom or in our second bedroom (because that’s exactly what guests want to stare it when they’re visiting, of course). I keep the obnoxious pictures out of the living room! Ok, once I finally hang it up, I’ll post it here… Still debating where it should go! I think it is obnoxious, but I love it. It’s kind of like wedding pictures–sure, they are usually overkill, but why on earth would you NOT want to remember that magical moment?!?! Besides, it is your house. Who cares what other people think? You EARNED the right to hang whatever marathon memorabilia you want. Now, if you tried to hang it at work or something that might be a different story. But I say, hang it with pride! OMG, you haven’t even seen the big setup I have with our engagement pictures. I forgot that soon enough we’ll be adding wedding pics to that and it’ll be even more obnoxious! Ha! Thanks! I still think it’s a tad obnoxious, but hanging it on my wall anyway! no way girl… cherish it!!! How about you? Making a poster anytime soon? I think it completely rocks. I’d love something like that. I LOVE IT!! I want one! It is not obnoxiously at all, you should be proud of such an amazing accomplishment! Let’s see if whoever visits our place will agree that it’s not obnoxious 🙂 It’s going up on the wall, either way! Feel free to steal the idea! (I made them at qoop.com — they have TONS of different options). I like the frame. 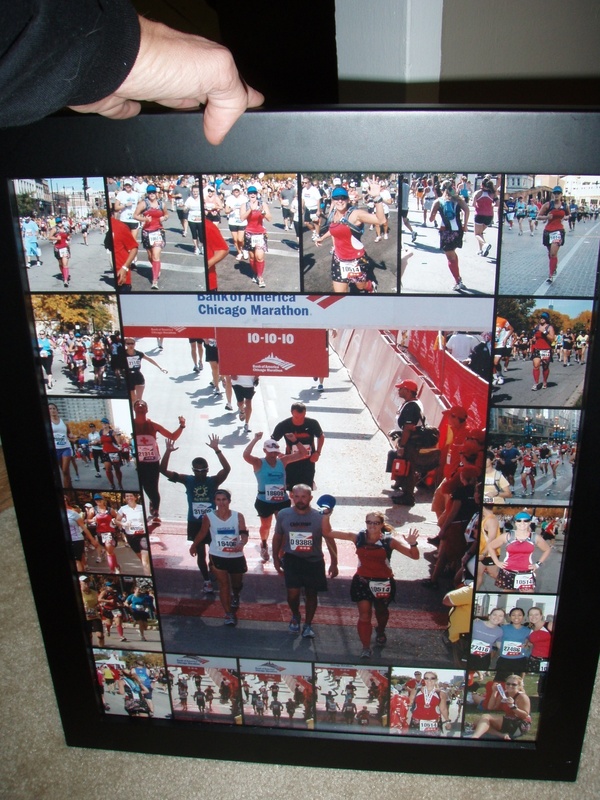 I bought something similar from marathonfoto but only used 4 pictures. I didn’t like all the pictures they took. But your pictures look nice. Congrats!